The brief appearance of the acorn-loving Scrat character over the Blue Sky logo at the start of Rio 2 is a reminder that this animation studio has now authored four films in the Ice Age franchise to date. These films had a strong, evolving plotline, but this sequel to 2010’s Rio needs considerable contrivance to bring all the characters back together; the setting isn’t even Rio this time, but the Amazon. Macaw Blu (Jesse Eisenberg) is re-introduced settling into his domestic life with fellow macaw Jewel (Anne Hathaway) and their three little bird offspring. No longer under the impression that they’re the sole survivors of their race, the macaws travel to the Amazon to discover Jewel’s family, led by their august patriarch Eduardo (Andy Garcia). Meanwhile old adversary Nigel (Flight of the Conchords’ Jemaine Clement), a bitter thespian cockatoo, is keen to get revenge on Blu, dragging along his sidekick, Gabi (Kristin Chenoweth), a frog whose poisonous venom Nigel hopes to use on Blu. Rio 2 takes in a few odd diversions, from Nigel’s spirited performance of Gloria Gaynor’s disco anthem 'I Will Survive' to a football match clearly intended to whet appetites for the action of the 2014 World Cup. But family issues are at the heart of Carlos Saldanha’s film, with Blu’s big city neurosis bringing him into mildly amusing conflict with his father-in-law’s notions about jungle life. Eisenberg’s nasal, anxious voice is ideally suited to Blu’s skittishness, but it’s the supporting cast, from Jamie Foxx to will.i.am, who try too hard to force the laughs, with such racial stereotyping sitting uneasily alongside environmental concerns. 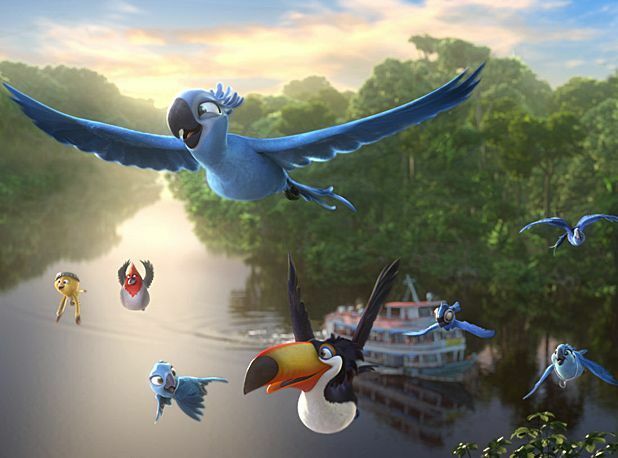 Like the Ice Age films, Rio 2 is an amiable enough cartoon, as forgettable as its predecessor but certainly colourful and incident packed enough to be marked as passable family entertainment. General release from Fri 4 Apr.